2009 has been unprecedented in the number of racetracks that have closed or ended live racing, and the same is expected for 2010. This year, five tracks have already ended live racing, and three more will join the list at the end of this month: Dairyland Greyhound Park in Wisconsin, Phoenix Greyhound Park in Arizona and Raynham Park in Massachusetts. While the numbers of greyhounds being bred to race is down significantly, there will be a resulting influx of dogs being retired each time a track closes. So, what are retired racers like as companions? Well, first I’ll say that I’m certainly no expert, and I’m far from objective. But I’d like to share a bit of what I know. The majority of greyhounds retired from the track are between 2 and 4 years of age. Generally, they have spent their entire lives in the racing system – from the breeding farm to training to racing. Many have never seen any dog breeds other than greyhounds. Most have never stepped foot inside a home, so mirrors, hard flooring and stairs are all new experiences for them. Approximately half of them are ‘tolerant’ of small breed dogs, cats and/or other small companion animals, meaning they can be taught to live peaceably in a home with them. Some may have never seen small children. As they are sight hounds, they should always be on a leash or in a safe, enclosed area. Their time on the track has taught them to chase, and most have no fear of cars – a deadly combination. They can reach a top speed of 40-plus miles per hour in just a few strides. Despite the years spent in the racing life, most of these dogs transition beautifully to life with a loving family in a home. They are intelligent and sensitive, docile and affectionate. They quickly learn to love their people, their animal companions and their new environment. As they are ‘kennel-broken’ at the track, meaning they are turned out to go to the bathroom several times a day, they adjust quickly to being housebroken. I adopted my first retired racer in 2003 in Florida. Her name was Condor, and she raced at tracks in Iowa and Florida. She was four years old, and described by the adoption coordinator as ‘aloof’. She came to live with my first rescued cat, my Rottweiler, and me. She had a single potty accident on her first day at home and then never again. She was timid with new people – something that got better with time but never went away altogether. She never learned to be comfortable around small children. She was quiet and sweet, very sensitive to guidance and about new situations, and the reason we’ve adopted five more since. The six greyhounds we have shared our home with have had their likenesses, but they have run the gamut in personalities. We have had two with outgoing, stranger-loving, silly personalities. We have had two extremely shy greyhounds, known as ‘spooks’. Three have absolutely adored small children, and three have feared them. Three of them could have happily been only dogs, and three have truly needed greyhound companions. They have all been affectionate, playful, low-shed and clean (no doggie smell!). They have all made me wish we could have more, and have inspired me to work to end the industry that exploits them. If you are interested in adopting a greyhound, the first step is, do your homework! 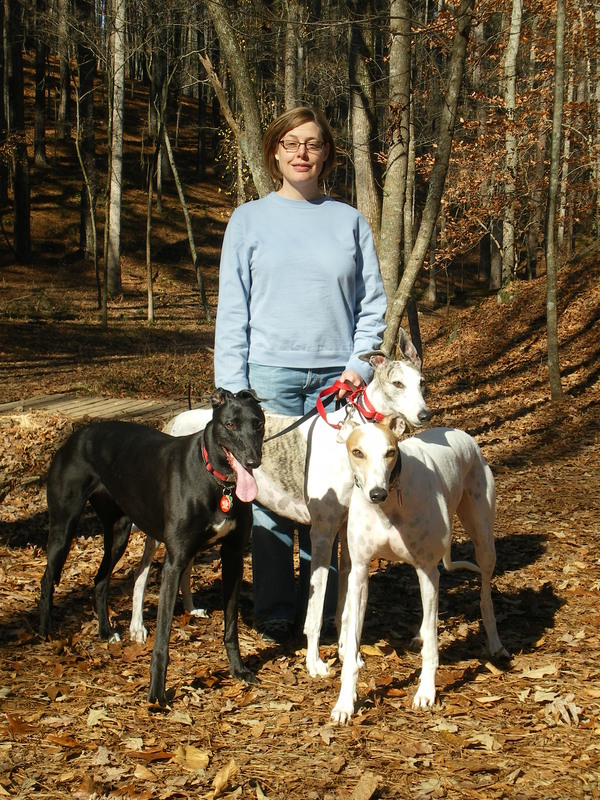 National Greyhound Adoption Program (NGAP), Greyhound Companions of New Mexico and Kansas City REGAP are excellent resources for information about retired greyhounds as companions. I believe the successful adoption of any animal is prefaced by extensive research and preparation. The next step is choosing a rescue group to work with. To quote the statement found on the website of Kindred Spirits Greyhound Adoption, I believe that ‘adoption without advocacy is never enough’. I personally prefer to work with adoption groups that advocate for the racing greyhound in concert with placing them in adoptive homes. GREY2K USA provides a list of adoption groups located throughout the U.S. Please consider adopting a dog displaced by the closings of Raynham Park, Dairyland Greyhound Park and Phoenix Greyhound Park in the coming months, but know that greyhounds are deemed surplus by the racing industry every day, and the need for greyhound adoption will not end until all of the tracks are closed. And if you are unable to adopt, please consider volunteering to assist the many organizations that are doing the wonderful work of placing retired racers in loving homes. You can visit the Greyhound Central Clearinghouse to submit an e-mail offering your support. I can promise that it will be some of the most gratifying volunteer work you will do. We’ve always been a cat family and are thinking about adding a dog. Greyhounds have always been on my mind. They’re so regal and beautiful. I grew up in Rhode Island, where greyhound racing is unfortunately still legal so I’ve seen the devastation that cruel sport brings to hundreds of innocent animals. However, now we live in a city and I’m a little worried about having enough space for a greyhound to get his exercise. Would you say they’re bad city dogs? If one were to keep them in the city, how long would they need to be walked each day? Greyhounds make GREAT apartment dogs. They are clean, quiet (generally, I have a rare “barking” greyhound — only when she’s very excited), and love to sleep. My own greyhound, Fiona, lived in my small 500sqft apartment. I took her out 4-5 times a day — 30 minute walk in the morning, a quick trip outside in the afternoon, 15-30 minutes before dinner, and a quick trip before bed. But as long as your greyhound gets one brisk walk a day and the chance to run in a fenced in area a few times a week, that is sufficient. I would take her to a dog run to burn off some energy (she would run for a few minutes before being ready to come home) and that was more than enough. P.s. Some (but not all) greyhounds are not good with cats or small animals, so just make sure you get one that has been tested with cats before adopting. Thank you so much for reading and for your interest in adopting a greyhound. Lindsay already did a wonderful job of answering your questions – thank you Lindsay! Because of their racing background, people often think of greyhounds as ‘high energy’ dogs. They are affectionately known as ’40-mph couch potatoes’! While at the track, they spend 20+ hours per day in their racing crates, so (unfortunately) they are used to having a lot of down time. I wanted to add that you could also consider adopting a slightly older greyhound, one that hasn’t just come off the track. Adoption groups will occasionally have a dog ‘returned’ – known as a ‘bounce’ – that has been in a home for some time, and the family is giving up the dog for whatever reason. A friend of mine adopted a 9 year old greyhound who was returned to the adoption organization because the family who’d had him several years were moving to Canada and didn’t want to take him for whatever reason. She has had two wonderful years with him and counting. The other opportunity to adopt a slightly older greyhound would be adopting a dog that was used for breeding – for instance, what is referred to as a ‘brood’. There are a few adoption groups out there that specialize in ‘older’ dogs like this.